Once I began to appreciate the complexity of what we Brits tend to call ‘curry’ I developed a fascination with Indian cuisine. I’m still learning about the regional variations and I suspect I’ll only ever get to understand the tip of the iceberg – but I seldom pass a chance to find out more. Kolkata is the capital of India’s West Bengal state, the part of India which shares Bengali cuisine with what is now Bangladesh. It’s a region of India which has a turbulent past, but despite that, in the 1950s, Calcutta had a real jazz vibe and ‘Rhythm’ and this particular Indian supper club promised to recreate that with live music to accompany a sumptuous Bangla feast. Who would say no! 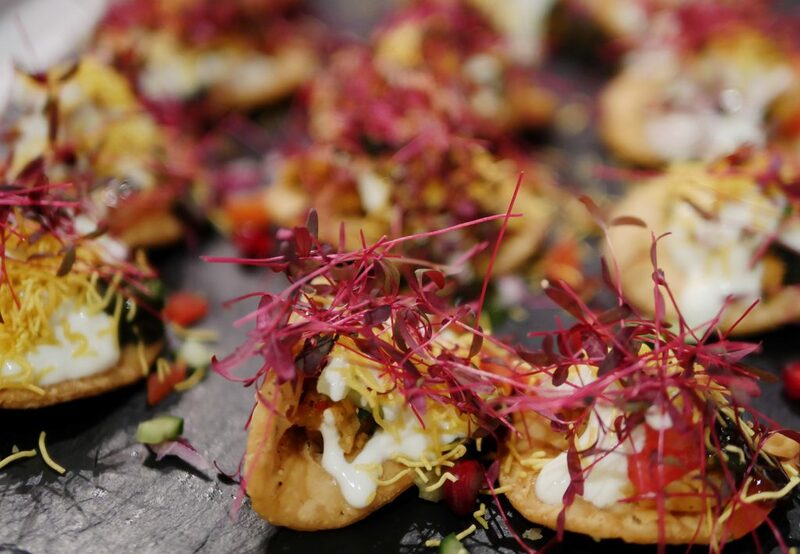 In any case, I am a big fan of supper clubs – events where you can enjoy a unique dining experience in an informal setting, even in London! Little Kolkata Indian supper club is the brainchild of Prabir Chattopadhyay who was born in Kolkata. His grandfather comes from a long line of priests who have served at the 15th-century Kalighat Kali temple in Kolkata (the oldest temple in Kolkata which we visited recently while staying at THE Park). 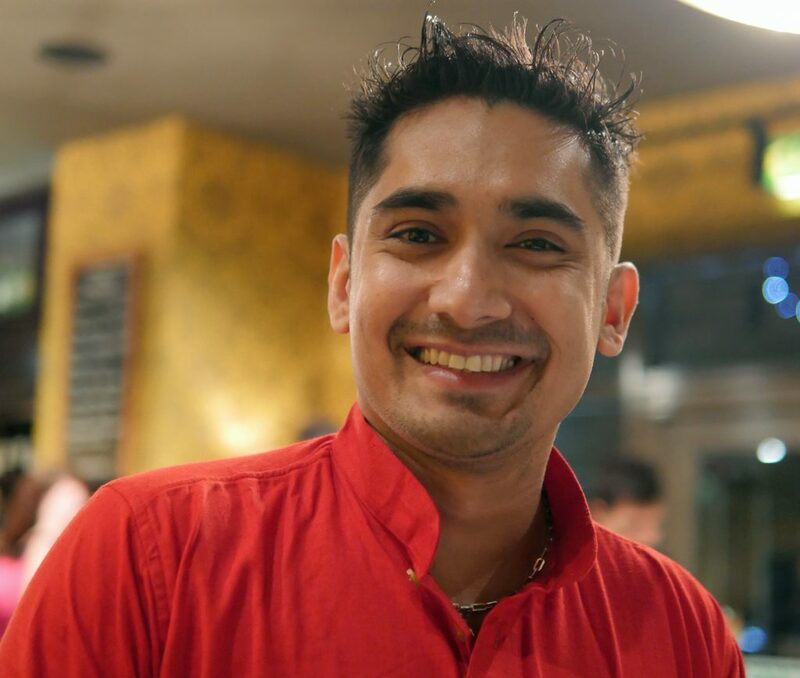 He grew up watching his family prepare and cook elaborate temple food in Kolkata, but moved to the UK in 2006 and currently works as the logistics manager for Arcadia Group. 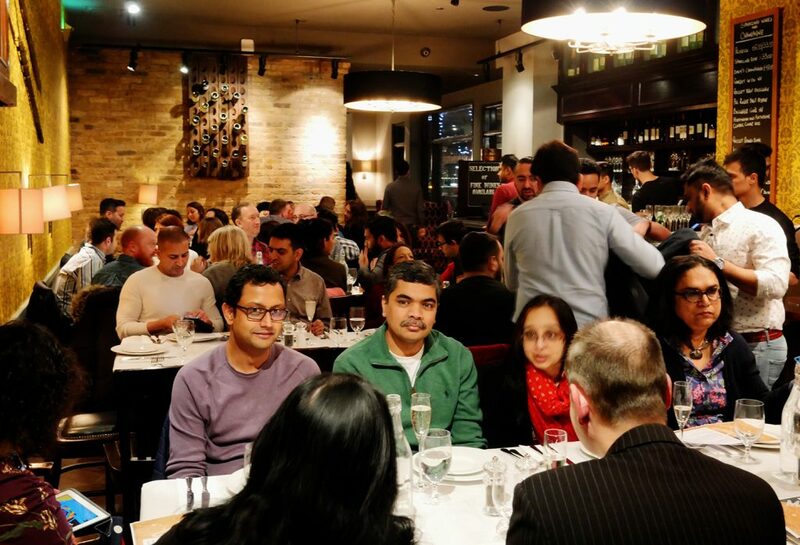 That skill with process management combined with a love and understanding of Bengali cuisine makes him perfectly placed to run a smooth supper club operation and I was thrilled to be invited along to learn more. We arrived on a wet and windy Saturday night to Davy’s wine bar in Canary Wharf. For those who don’t know London, both the City and Docklands can be quiet over the weekend when the financial services businesses are closed. So, a normally shut-at-the-weekend bar became the home for Little Kolkata for one night only. A warm room full of large sharing tables, welcome cocktails of rose and ginger bellinis and we sat down to wait for food to arrive. First Doi Papri Chat – those little semolina disks topped with spicy potato and yoghurt. They tasted every bit as good as they looked and our plates were quickly empty. 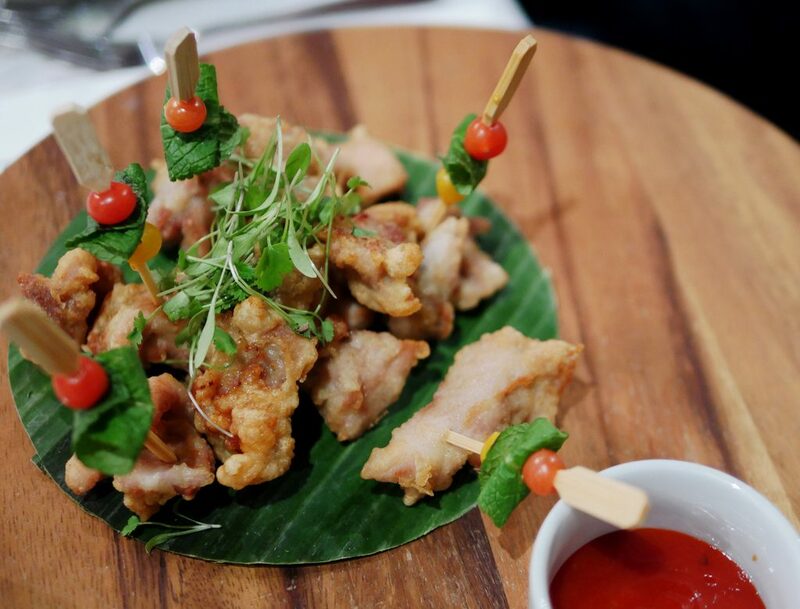 Next, platters of Tangra Indo Chinese chicken pakora. Tangra in Kolkata is a Chinese community which once had a population of over 20,000. Now there are around 2,000 Indo Chinese in the area – a Chinatown with eateries and more in the heart of Kolkata. 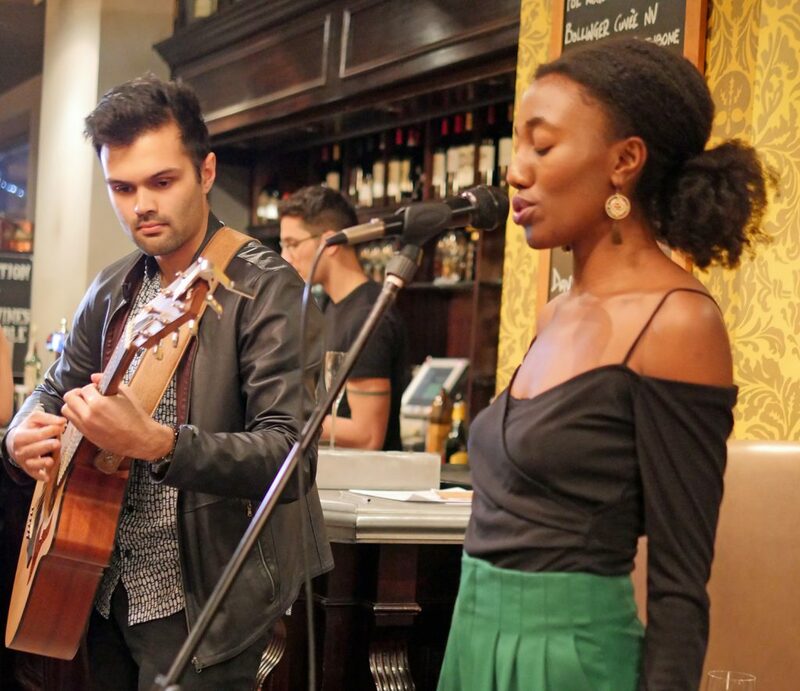 Chisara Agor, a stunning London born singer-songwriter interrupted our gluttony with a charming set of jazz fusion songs and standards while we sipped on more cocktails, prosecco and Kingfisher beer. That balance of acoustic guitar and vocals is just perfect for an intimate supper club environment, but although we could have talked over her singing, we all listened…a reflection on the quality of her voice. 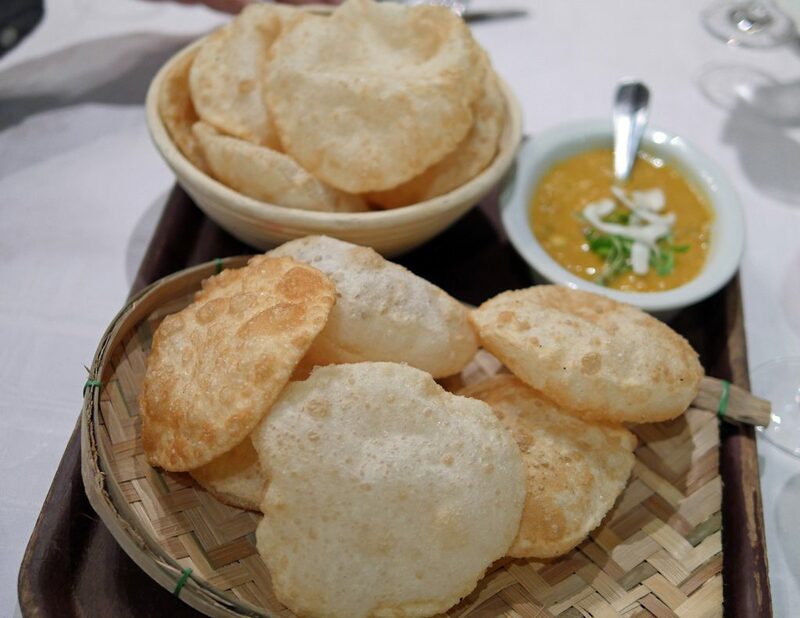 Then on to main course – baskets of deep-fried luchi – puffy, soft on the inside and crisp on the outside bread to accompany the cholar daal, a festive lentil stew with coconut and cashew which is normally served for special occasions – pooja for weddings, festivals or special guests. 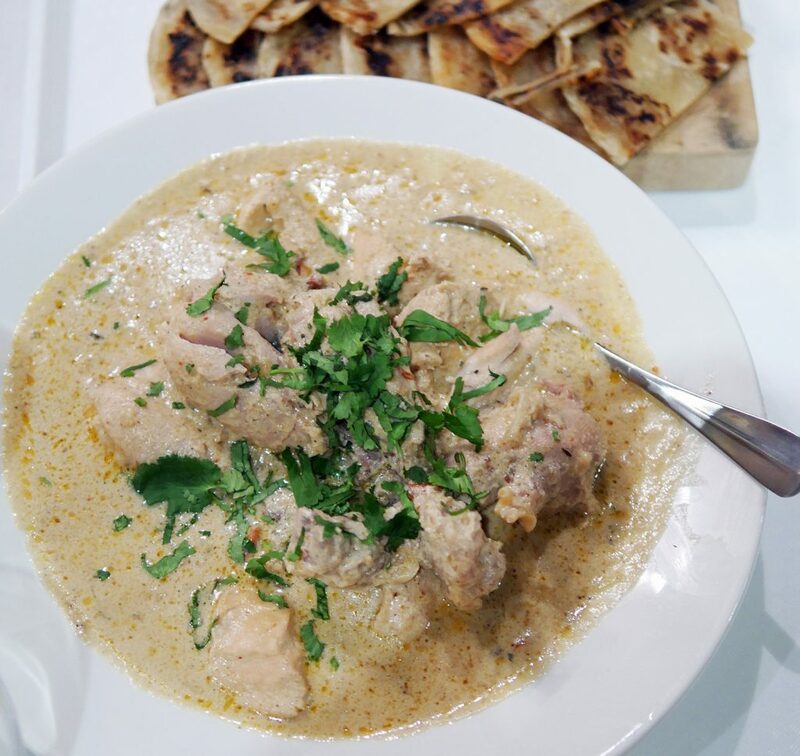 Then chicken rezala with porota flatbreads which we learnt was a tribute to The Nizam’s Mughlai food. I’ve had to google to find out more – but The Nizam turns out to be a famous Calcutta eatery that is credited with inventing the Kathi Roll (a kind of kebab with egg wrapped in a flatbread). 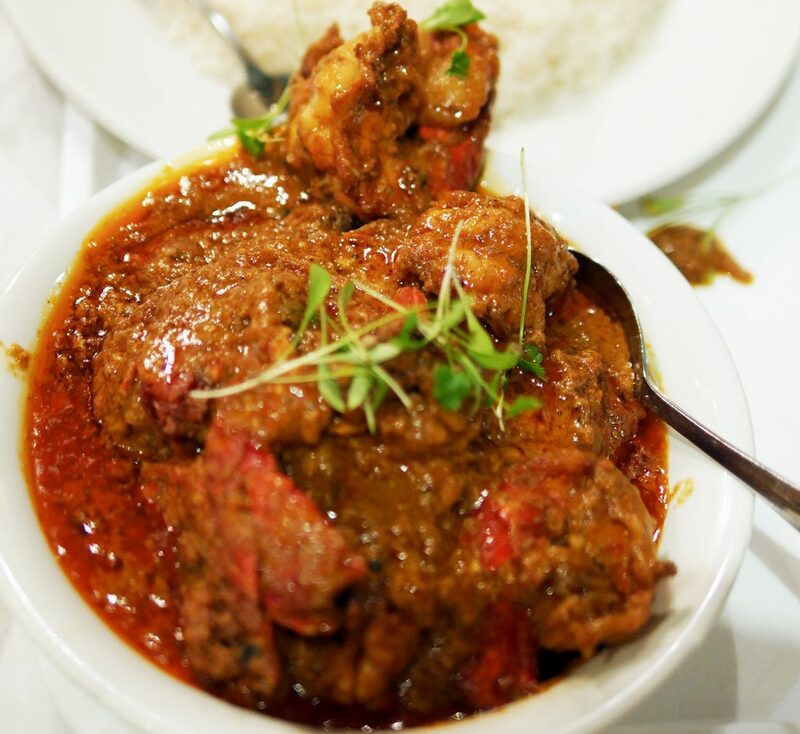 Chicken rezala is a rich dish of chicken in a white gravy laced with spices and nut pastes. Very delicious indeed, the meat was falling off the bone and beautifully tender without being at all dry. We may not have needed more food, but there was Prawn Malai to follow with ghee rice – prawns cooked in a coconut cream which was based on the recipe of our host, Prabir Chattopadhay’s own mother. Another celebratory dish, this was rich and spicy with impossibly plump and tender prawns. By this stage, we were completely full, but there were two desserts to follow. 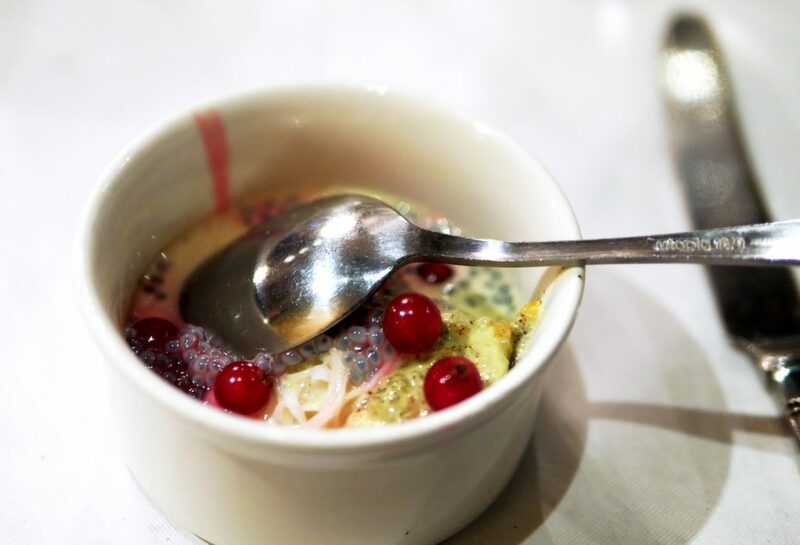 We stayed for the paan kulfi with rose faluda – Indian ice cream served with vermicelli and rose syrup but had to leave before the Narkol Naru – coconut and jaggery spheres as my guest needed to travel back to Surrey. In any case, I’m not sure we’d have managed another mouthful!